We describe ourselves as wool artists. Each year we work on street art and teach at festivals. 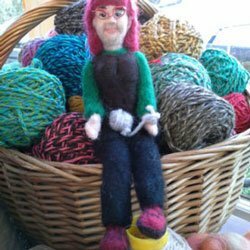 We prepare fibres and yarns from locally sourced fleece. We spin and felt these in many different ways for knitting, needle felting, weaving, crocheting etc. We often sell left over materials from our projects at wool events.